Twin Liquors recently held their "$1 Sale" where everything is marked down to the wholesale price and they add $1. It produces some astonishing values--and even more remarkable damage to my bank account. It's a mad-dash the morning of the sale, with a line snaking around the block, though far more polite than those horrifying videos on Black Friday where Wal-Mart shoppers tear each other apart for a $5 waffle maker. While walking around with my full shopping cart, I decided to add this Bowman Single Barrel for $26, because why the hell not? And I'll be damned if this one isn't a little engine that could. It shows a surprisingly good nose, with lots of cinnamon and chocolate. And it's not too sweet, with plenty of rye spice, and a good bit of oak in the long finish. It tastes cask strength and has plenty of heft throughout, without being alcoholic. In fact, it's far more akin to the better bottles of E.H. Taylor Barrel Proof. So, yes, color me shocked: this is actually a really nice bottle. Back in the day, the Bowman bottles were incredible, esp. 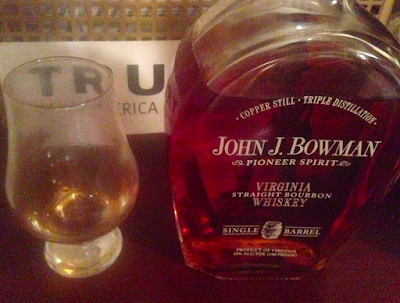 the older ryes and bourbons selected by The Party Source. But then Bowman started doing gingerbread and coffee finishes, and the gimmicks seemed too silly to try. As a result, I never bothered to try the Single Barrel. Maybe the triple distillation knocks out the nasty note that I usually find in so many BT products? And this is a single barrel, so expect some variation in your bottle, but I'd buy more of this. One suggestion to BT: how about some info on the cask? If it's a single barrel, put the details on the bottle, gang. There's nothing to be found, so how can I know if I'm buying the same one next time? A bizarre oversight that should be corrected. Better yet, just make me the CEO and I'll scream "you're fired" at whoever designed the deficient label. 85 pts/B. For $35, it's a solid value in today's market. If you're considering donating to the ACLU or Planned Parenthood, please spend your money on this instead.